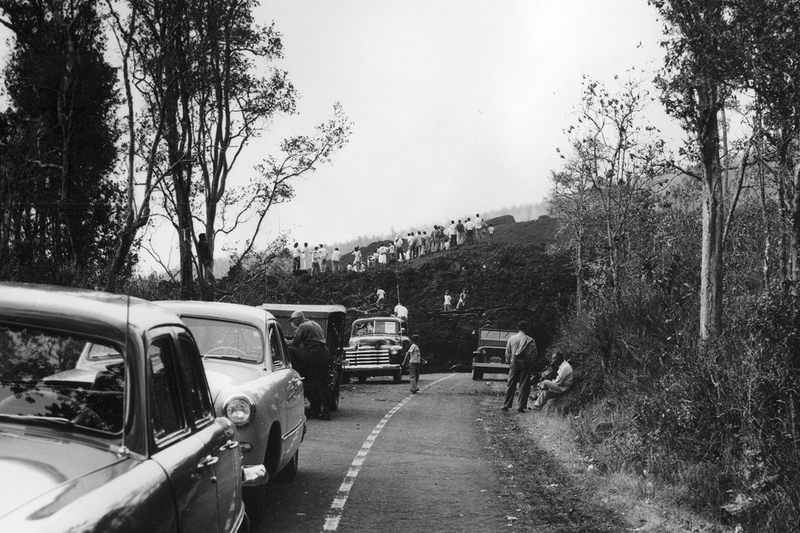 During the Mauna Loa 1950 eruption, three large, fast-moving lava flows advanced down the west flank of the volcano, each crossing the main highway before reaching the ocean. 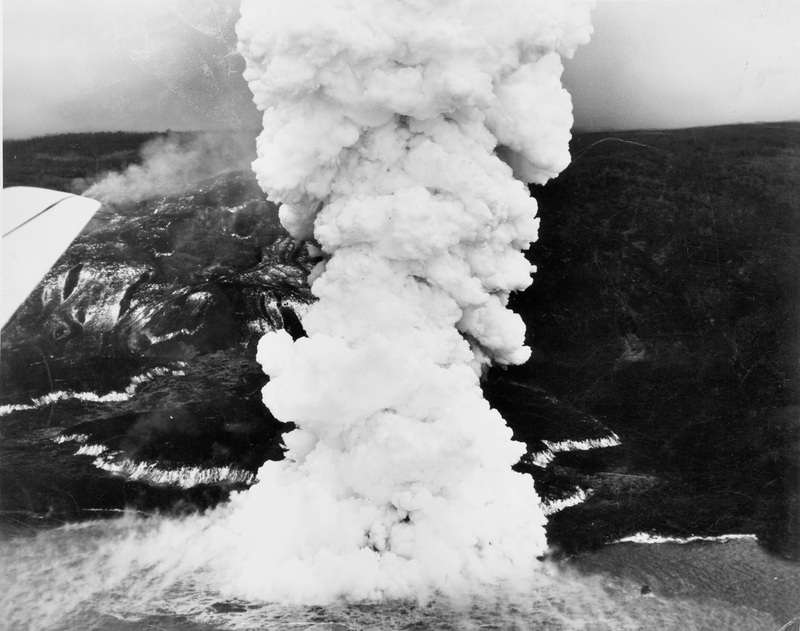 The Ka‘apuna flow, shown here, traveled from the Southwest Rift Zone vent (7,800 ft elevation) to the coast in just 17 hours, creating a huge steam plume as lava flowed into the sea. 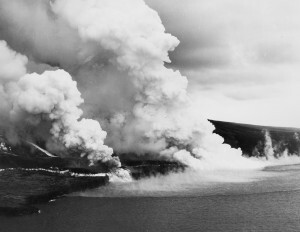 The glowing edges and fast-moving channels of the 10- to 25-ft thick ‘a‘ā flow appear white in this June 2, 1950, aerial image. Photo courtesy of Air National Guard, 199th Fighter Squadron. Mauna Loa, the largest active volcano on Earth, is not erupting, but is stirring. Seismicity remains elevated above long-term background levels, and ground deformation indicates continued inflation of a magma reservoir beneath the volcano. As we keep a watchful eye on this unrest, we continue to study and learn new things about Mauna Loa’s previous eruptions, which influence how we interpret the current activity. Some of our recent studies are focused on the 1950 Mauna Loa eruption, one of the most spectacular Hawaiian eruptions in recorded history. In March 1950, Mauna Loa inflation was so significant that tilt was recorded at the summit of Kīlauea. Two months later, continuing deformation was accompanied by a sharp increase in small earthquakes, signaling the increased probability of an eruption. 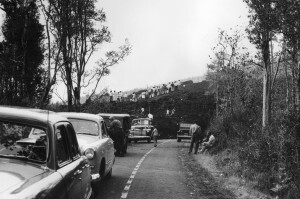 Spectators seeking a closer view of lava climbed up the levees of a thick ‘a‘ā flow that crossed Highway 11 during the June 1950 eruption of Mauna Loa. Stories of this and other lava flows in Ka‘ū and Kona will be recounted by USGS scientists in upcoming public talks. Photo: U.S. Army Air Corps. On May 29, an island-shaking magnitude-6.4 earthquake occurred beneath Mauna Loa’s west flank. Sixty-four hours later, at 9:04 p.m., HST, on June 1, the eruption began, with fissures opening at the summit and uppermost Southwest Rift Zone of the volcano. The fissure eruptions quickly spread down rift—from 3,845 to 3,350 m (12,600 to 11,000 ft) elevation—sending floods of lava to the west and southeast. Volcanic gas emissions fed a mushroom-shaped cloud up to 3,050 m (10,000 ft) high above the volcano’s summit. By 10:30 p.m., the Southwest Rift Zone had “unzipped” down to an elevation of 2380 m (7800 ft), unleashing an 18-km- (11-mi-) long trail of spectacular lava fountains that fed several large-volume, fast-moving lava flows. These flows reached the south Kona coast in about 3 hours, endangering lives, destroying property, and severing the main highway and telephone lines along the way. The eruption lasted 23 days and produced 376 million cubic meters (491 million cubic yards) of lava, with over 90 percent of that volume issued during the first six days of the eruption. With an eruption rate 200 times greater than that of Kīlauea’s current eruption, the 1950 Mauna Loa eruption produced more lava in six days than Pu‘u ‘Ō‘ō typically erupts in over 4 years! Field observations and geologic sampling of lava from the entire extent of the 1950 fissures document changes in the lava chemistry and mineralogy over space and time during this phenomenal event. At elevations above 3,350 m (11,000 ft), the earliest 1950 fissures erupted comparatively low-temperature magma, cooled and partly crystallized within a shallow summit reservoir that presumably also fed earlier eruptions. Two of three lava flows that raced down the southwest slope of Mauna Loa on June 2, 1950, are shown here. As lava entered the ocean, steaming water marked its offshore course. A semicircular area of hot, turbulent water killed many fish that were seen drifting on currents or washing up on shore over the next few days. Photo courtesy of U.S. Air Force. As the 1950 eruption progressed, lower elevation fissures erupted increasing volumes of hotter and more “primitive” magma with an abundance of minerals formed at high pressures and temperatures. These minerals crystallized from their host magma within the mantle (around 18 km, or 11 mi, deep) or were incorporated as magma rose through deep roots of the massive volcano—a sign that magma ascended quickly from great depths. Chemical zonation patterns of individual mineral crystals in the 1950 lava provide clues about the earliest stages of magmatic activity beneath the volcano. Crystals erupted from lower elevations indicate that magma began to ascend within the upper mantle up to 8 months before the eruption, and that the rate and amount of magma transport was increasing in the weeks prior to the eruption. Laboratory experiments were performed to test how long minerals formed at high pressures in the mantle could survive low pressures at shallow depths within Mauna Loa’s magma chamber. Results show that some crystals erupted below 3,350 m (11,000 ft) could not have survived longer than a day in the shallow edifice—further testament to the unusually rapid ascent of magma immediately before the eruption began. During the 1950 Mauna Loa eruption, huge volumes of magma were transported rapidly from great depths with little warning of just how furious the eruption would be. Our findings suggest that key indicators of another such remarkable eruption might occur just hours before magma reaches the surface. The USGS Hawaiian Volcano Observatory’s monitoring networks are well-suited to recognize this sort of unrest and we are actively working to improve our monitoring capabilities even more. This allows us to quickly identify, respond to, and communicate changes in activity—critical capabilities needed to protect life and property.